I've grown fond of the following features in Visual Studio 2012. Because Visual Studio 2012 doesn't convert solution and project files, you can use 2012 even when the rest of the team uses VS2010. Even when you know where the option or menu item lives, it's often quicker to hit Ctrl+Q and type a few letters to find a command or option. It's the real object explorer from SQL Server Management Studio - now available in VS. Go to View -> SQL Server Object Explorer, or use a Ctrl+\, Ctrl+S shortcut. You can manage server logins, drop databases, and open a new, un-crippled query window. Click in the search box underneath the toolbar, or use Ctrl+; to go there and keep your fingers on the keyboard. 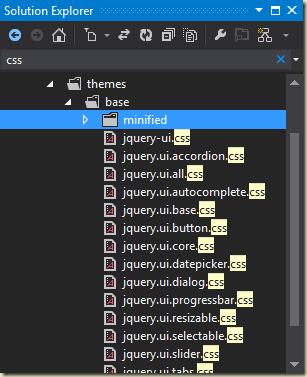 It's a great way to find, for example, all CSS files in a project. The search parameter stays in effect until you clear the box, and you get to see the files in the their solution hierarchy. It doesn't search just files, though, you can also find members by name. When working with a bunch of open files, trying to find a specific file in the horizontal tabs of the editor can be a pain. 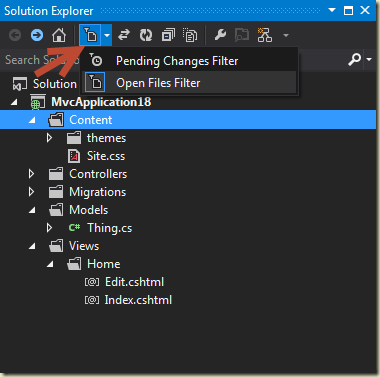 The Open Files Filter button in the Solution Explorer toolbar can show only the open files in Solution Explorer, being both vertical and hierarchical, can make open files easier to find. My favorite VS 2012 feature is...ReSharper 7. LOL. Kir deserves a gold star for that one! haha, yeah I am with you Kir. ReSharper is the #1 feature by far. Still the powerhouse in keeping things moving forward fast and making solid practices easier to follow! Is the SQL Server Management Studio browser only available in Ultimate? I'm running Premium and can't find it. That was going to be good news too. @Todd: I thought it was everywhere. It's not an option under the View menu for you? Or, can you search for it in the quick launch? @Todd: I too have VS 2012 Premium + Sql 2012 Express. Open 'Server Explorer', right-click on 'Data Connections', 'Add Connection...', choose 'Microsoft SQL Server' from the listbox, leave 'Always use this selection' checkbox set or not set as you see fit, click the 'Continue' button, enter ".\sqlexpress" in the 'Server name:' box, click the 'Test Cpmmectopm' button. At this point, your Server Explorer window will show a new Data Connection of the form "yourpcname\sqlexpress.master.dbo" (db name might differ if you chose to auto-connect to something else). 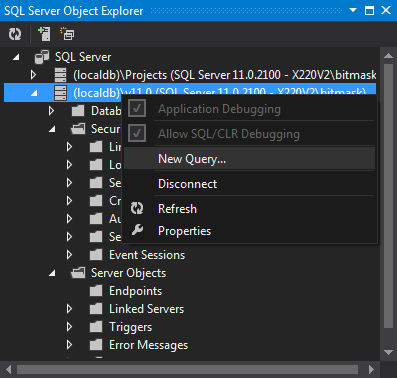 @Todd I can confirm the SQL Server Object Explorer is also available in VS 2012 Premium. Maybe you didn't install the SQL tools from the setup? @Fred It is NOT the same as the Server Explorer, it has a lot more features. Server explorer is much better now because it reads the ConnectionString setting in the web config for direct access to the project DB. Very useful for me. Nice! I really like the open files filter, I'm sure I'll use that all the time. How does VS2012 perform with Resharper 7? I recently started using Resharper with 2010 and there is a noticeable performance hit on a speedy machine. I love R# 7. I don't notice a performance hit, but then I've always had it installed. tee shirts, women of all ages marketing polo tops, and youngsters discount polo tops, you can visit paylesspromotions.net.au.